In 2015, I launched my first official senior model program in order to provide a unique experience, focusing on self-esteem and being the best YOU you can be. They are my #FLYgirls (First Love Yourself). And, to me, one very important piece of this program was to include community involvement. The one thing that intrigued me was the idea of doing a fashion show for charity, but I honestly felt overwhelmed when it came to planning. I was lost. How was I going to do this on a short timeframe with no budget and no experience, and expect it to be a success? I wasn't sure, but I knew I wanted these models to have an amazing experience, and I wanted to be able to show them how rewarding it is to give back. So, I set out to make it happen. Within three months, I was able to put all of the pieces together and create an entertaining and memorable experience for the models and the guests, which resulted in $2000 for our chosen charity and a lot of requests for a repeat performance the following year! Fast forward to 2016, and we raised OVER $4600!! I can't wait to see what 2017 brings!! I want to share this with YOU! I want you to have the plan and the know-how to give back to an amazing charity in your area! Yes, it takes time and planning. However, you can raise money for charity without spending hundreds or thousands out of your own pocket. It doesn't cost me anything more than my time, which I am happy to give for a great cause! When I planned my first show, I had no blueprint to follow. I definitely learned a few things along the way. After speaking to other photographers who had either attempted and failed, or wanted to try but had no direction, I decided to put this guide together and share my steps with you! It's over 10 pages, and I haven't skipped any details. I am an open book! My hope is that this encourages many of you to take the next step toward putting together your own community fashion show to raise money for a cause that matters to you! We also have a private Facebook group to help answer all of your questions and provide encouragement along the way! I can't wait to see where this takes you! I had the pleasure of reviewing Heather's Fashion Show Guide this past week and, let me tell you, it is the perfect spring board to starting your own charity fashion show. This 11-page guide assists you with the nuances of that first show. Heather has outlined her process. How do I know it is good? 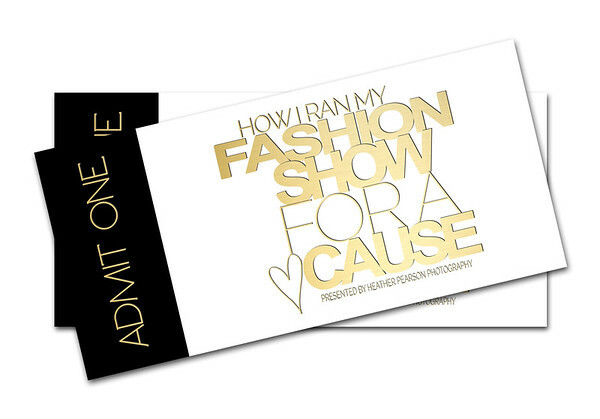 Because this will be my fourth year doing a charity teen fashion show! I wish this guide would have been around for my first one, it would have saved me some time! FABULOUS content! Detailed and well organized. I'm super excited to really dig in and formulate my 'plan' of attack for presenting it to my women's business group board! If anyone wants to do an EPIC event in their community this year, here's your blueprint! Thank you again Heather for being generous with your knowledge and talent! Ready to launch your own successful show? Click below, and you're on your way! DUE TO THE DIGITAL NATURE OF THIS PRODUCT, ALL SALES ARE FINAL. NO REFUNDS. THIS IS A ONE-TIME DOWNLOAD INTENDED FOR THE PURCHASER ONLY. THIS PRODUCT MAY NOT BE SOLD, SHARED, OR IN ANY WAY REDISTRIBUTED.